Creating a welcoming habitat for creatures means knowing what not to mow. ‘WHERE ARE THE BUTTERFLIES?” was the woeful refrain last fall, as disappointed visitors stood in front of my 75-foot row of purple asters. People come to my Gloucester garden expecting to see monarchs languidly fanning their orange wings while nectaring on the asters, making the row vibrate with the colors of sunset. 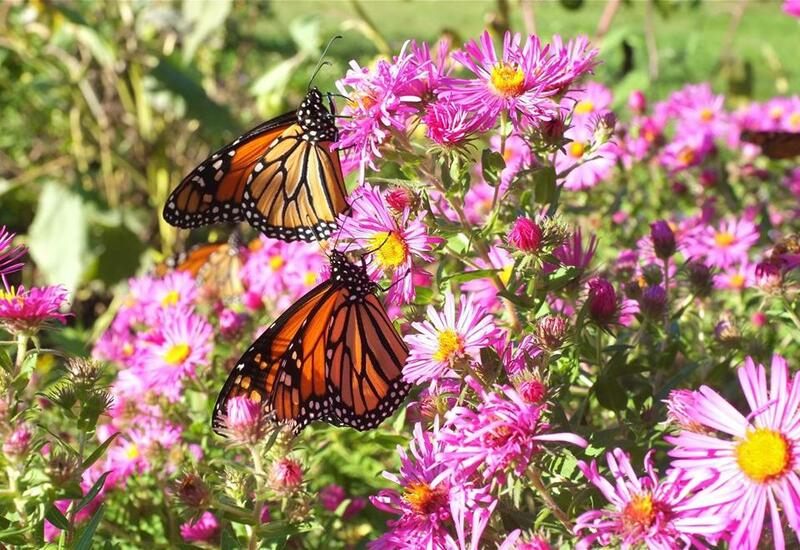 My husband and I live near Audubon’s Eastern Point Wildlife Sanctuary, a traditional stopping point for monarchs on their autumn migration to Mexico, and the asters are their road food. In 2013, five showed up in our garden for a feast meant for thousands. “Go home and plant milkweed” was all I could say. Monarchs lay their eggs on this aromatic plant, and the resulting caterpillars feed solely on its leaves. Known for its decorative pods in the fall, milkweed has disappeared due to over-cultivation, drought, and herbicides, and with it, the butterflies. 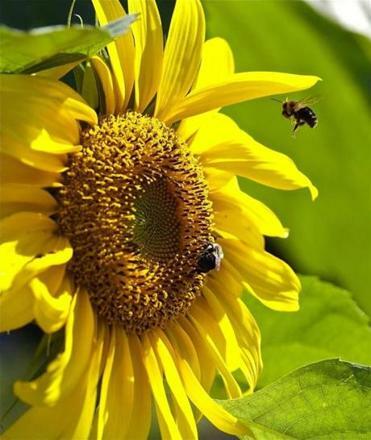 We notice their decline because they are so dramatic, with their bold markings and migratory behavior, but we are losing pollinators and other garden friends for the same reason: lack of habitat. Creating a backyard sanctuary can provide replenishment for many species, including our own. To do this, a gardener needs a light hand and an observant eye. I encourage common milkweed (Asclepias syriaca) by not mowing where it emerges, looking somewhat like asparagus. I plant other varieties, including the creamy orange Asclepias tuberosa. Once monarch caterpillars morph into their winged glory, resident butterflies can feed on a wide variety of flowers, but the migrating flocks need fall bloomers to fuel their journey, such as native asters and goldenrod. These, too, must be recognized in their pre-flowering state (lance-like leaves along a single stem), then let be. The tall plants along my vegetable garden are New England aster from seed collected by a friend years ago. They can be pinched back, but the butterflies prefer them lanky, so it’s one less chore for me. Nature loves a lazy gardener, but that does not mean a habitat garden must look like a weedy lot. A hedgerow — a mixed border of closely packed trees, shrubs, and flowers — can provide beauty and privacy for humans and refuge for a host of creatures. It can be as small as a few square feet, with a spirea bush and angelica tucked under a pagoda dogwood, or it can be a fragrant fence of spicebush, elderberry, clethra, and shrub roses. When in 1979 we came to the Ramparts Farm, which has been in my husband’s family since 1918, much of its 6 acres was smothered in bittersweet, an invasive vine with berries most birds spit out. Using a brush hog on a 1946 Farmall tractor, we have opened up the fields and continue to replace the bittersweet with more productive habitat. Sometimes this is a rescue operation. In the thickets, we often find cowering natives, like wild cherry deformed by the strangling vine, or shad (Amelanchier), which produces ethereal white blooms around Mother’s Day in Gloucester. I also save sumac because I like the fuzzy red bits, and so do the chickadees. Then I add to what nature has provided with bayberry, juniper, various viburnums, hazelnut, and crab apples, basically anything easy that earns its keep with forage and shelter. As for design, I mix it up, with shade-loving fothergilla under the hazy smoke tree, or blousy weigela alongside stark winterberry, aiming to satisfy the broadest range of tastes, including our own. If I am vigilant, I can beat the birds to the elderberries for a rich, dark jelly. While I give preference to natives, I also welcome industrious immigrants, such as the seven son tree (Heptacodium miconioides). It is fast growing to 20 feet, with autumn flowers that provide sun-seeking monarchs with their last hit of nectar before nightfall. The butterfly bush is an import, but insects don’t care. It puts out pollen all summer long. Cultivated varieties, such as the polite ‘Blue Chip,’ won’t take over the yard, and yellow ‘Honeycomb’ is often still in flower for the migration. Around the shrubs and trees, I plant assorted asters, monarda, coneflowers, or whatever needs dividing from the perennial beds, even mint. Lawless transients, like foxglove, mullein, and pokeweed, appear where they please. Some I help along, scattering borage seeds for sky-blue blooms that sag from the weight of bees. Dill and fennel are easy seeders, too, and will attract aphid-eating hoverflies if left to flower. I start some annuals inside, such as ‘Autumn Beauty’ sunflower and the strapping hot-orange tithonia, a hummingbird god. Hedgerows are kept weed-free and watered the first year, then expected to live with limited assistance after that. Leaf litter keeps roots moist and fertilized, so I do not even rake, to the delight of salamanders and slug-slurping snakes. One of the great joys of gardening is having wild things nearby, so I do not thwart them with pesticides and herbicides. The plants above will need neither. I am tolerant of superficial damage, because none of us is perfect. For the delectation of wintering birds, I usually leave seed heads in place, but this past year I made an exception. When the milkweed pods turned brown, I cracked them open and sent the gossamer seeds airborne, hoping for a miracle. JoeAnn Hart is the author of the novelsFloatand Addled. Send comments to magazine@globe.com.